A collection inspired by the Victorian era with ornate feminine details, Abalone, Mother Of Pearl, freshwater pearls, Swarovski crystal and delicate filigree. In burnished silver plate with shades of grey. 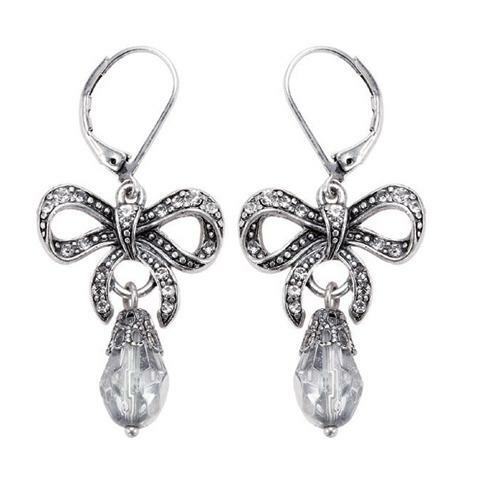 Pretty bow earrings. Detailed bow set with clear Swarovski crystals. Smoked grey faceted crystal drops. Bows measure 2cm/20mm. Length 4.5cm/45mm. French clip for pierced ears. Pretty filigree flower earrings. Detailed flower shapes over-lay each other to form this beautiful design. Set with clear and grey Swarovski crystals. The floral shapes measure 2cm/20mm. Length 4cm/40mm. French clip for pierced ears. 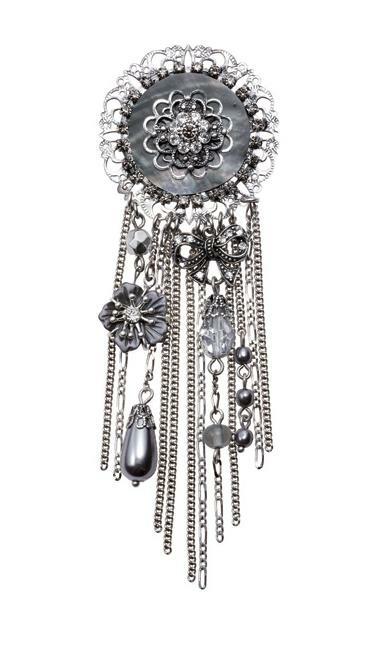 Stunning chain cascade brooch. Beautiful details decorated with mother-of-pearl and Swarovski crystals. The brooch is 12cm/120mm in length x 4cm/40mm wide. Various charms and beads measure from 5mm up to 1.5cm/15mm. Traditional hinged back pin with over-lock catch. Exquisite stretch style bracelet. A gorgeous mix of pearls, crystal and silver beads form the band. The focal section comprises a cascade of charms and chain. Length of longest chain 5cm/50mm. Smallest bead 5mm. Largest charm 2cm/20mm. Unstretched inner circumference measures 7 inches/18cm. A stunning pendant with a disc of shimmering pearlescent mother-of-pearl, and filigree overlays. Decorated with clear and grey Swarovski crystals. The back of the pendant is as beautiful as the front. The pendant measures 4.5cm/45mm in diameter. A multi-chain necklace that measures 40cm/16 inches to an adjustable 48cm/19 inches. 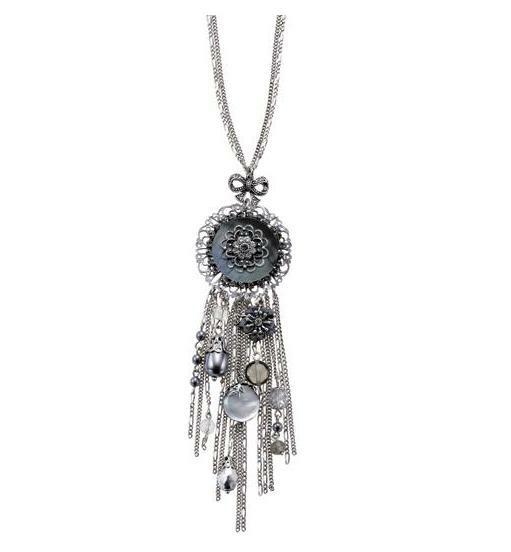 Stunning chain cascade pendant necklace. Longer length necklace. Beautiful details decorated with mother-of-pearl and Swarovski crystals. The pendant is 13.5cm/135mm in length x 4cm/40mm wide. Various charms and beads measure from 5mm up to 1.5cm/15mm. Multi-chain necklace measures 64cm/25 inches to an adjustable 71cm/28 inches. You can wear this chain doubled-up to achieve a shorter length.